Reaching your consumers through natural pathing is a goal of all advertisers. If there is one mantra I have come to use in online marketing that’s go to where your customers already are. There are many examples of advertisers, across industries, trying to build their own Facebook, their own Snapfish, or their own YouTube. There are also a lot of ideas out there right now trying to gain inclusion in people’s social networks. While all of this is important to evaluate when developing an online brand experience, one of the better ideas in online media has seemed to lost its cache and that is online content integration. I finally came across a good example from a recent email marketing newsletter sent to me by GMC. 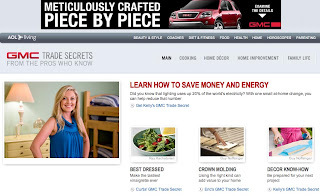 GMC Trade Secrets on AOL Living brings together useful consumer content relevant to the passion points of its potential customers. The execution also brings in some HGTV celebrities: Eric Stromer, Kelly Edwards, and Curtis Stone. The AOL Living section provides some rich DIY content that was developed custom for this site and not just a repurpose of content. My favorite was “Fix Driveway Stains” a nice integration of automotive relevancy and homeowner tip that currently has over 800,000 views. Some nice touches include the “Get Weekly Updates from the GMC Pros” email hand-raiser. 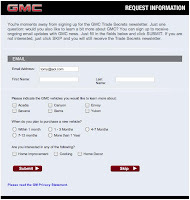 GMC requests some information about vehicles people would be interested in, plus timeframe when they may be in-market, but it also lets the user Skip the form and just sign up for the Pros' email content. GMC is respectful that all of the visitors may not be interested in the vehicles so the Skip button is prominent. The site also includes an Ask the Pros section under every video. Unfortunately, like a lot of content sites like this the replies to questions asked are non-existent. People left a lot of questions on the site but it seemed only about 1 in every 8 had a response; though, the response was typically from another user of the site, not the Pro. Overall the site really meets the homeowner, do-it-yourselfer at a level that is worthy of their time. Even with all of the GMC ad banners on top and along the margins, the site features the Pro content without overly pushing GMC in an obnoxious way. Sure there is some quick pre-roll of the Pros driving a GMC vehicle before a video tip is given but at least it uses the Pro in the pre-roll and isn’t a 15 second GMC ad.